How do some financial bloggers fare when there’s gloom and doom in the stock market? With the middle of the year upon us, I expected the equity markets, and thereby our investment portfolio, to experience a dip. The summer period is usually the time in the year when markets take a breather along with investors who decide to take their summer breaks. And it looks like the market itself has been on vacation for some of us financial bloggers. I belong to a small network of financial bloggers called “The Money Writers”. Part of what we do in our group is to compare notes on blogging, entrepreneurship and yes, even investments. Because of the significant events going on in the stock market, it’s been a huge topic conversation for us. And in this particular case, misery loves company! We just released our mid-year investment performance numbers and they’re not too pretty. Only one of us seems to have eked out a small loss at this time, and that’s Frugal Trader from Million Dollar Journey. I’m big on index investing so my portfolio tracks their respective index benchmarks closely, whereas some of the other Money Writers have their positions in managed funds and may have a higher concentration of investments outside of the U.S. (as I expect Frugal Trader to have, being from Canada). Also, our asset allocation models are all different: while some of us are playing more conservatively, others are more fully invested. 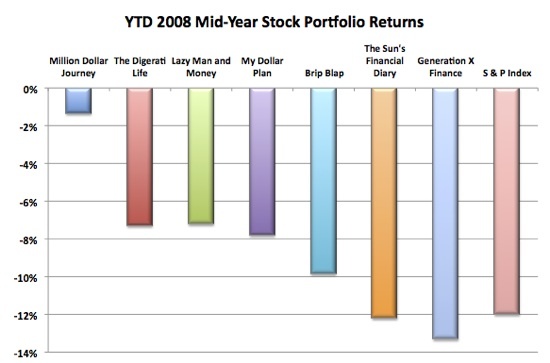 I’d classify my portfolio as moderately aggressive (or moderately conservative, depending on whether you see the glass as half empty or half full), with a 25% cash position that simultaneously stands as a bear market buffer, as a source for emergency funds and as money my family withdraws to pay for our current expenses while my spouse and I work on a startup and small business. The Money Writers all have our different goals and objectives and personal circumstances in life, and that will partially explain the variances in the constitution of our portfolios and their returns. We may all be in the red for now, but we remain committed investors all waiting for the market coasts to clear. Thanks for the mention SVB. Yes as you mentioned, most of my portfolio is tied to the Canadian market thus the smaller loss. In terms of types of securities, I hold mostly individual stock. Interesting how my international funds haven’t done too well either — they’re mostly in the MSCI EAFE index. I checked the Canadian index and I’m amazed by how well it’s done recently! Just looking at the last 5 years, I’m surprised by its performance relative to the S & P. I thought it would actually be more closely correlated to the U.S. but the charts don’t show it. LOL, For my case, I’d give credit to asset allocation, while others may attribute their better returns to better stock or mutual fund picks. It’s times like this that a big cash position really helps (just a couple of years ago, I was regretting that big cash position when the market was going gangbusters). Moral of the story: stick to the allocation you’re happy with. I like to use marketocracy to track portfolio returns (actually calculating returns correctly with cash additions during the year is fairly challenging). I agree it isn’t incredibly challenging but it is done incorrectly quite often. My portfolio there is showing a decline of 6.2% for the last 6 months (120 basis points above the S&P 500 for the period). They also subtract a 2% administration fee and charge brokerage fees on trades. 12 Stocks for 10 Years Update – June 2008. Part of their concept is they actually do run a mutual fund like the one you mention for bloggers based on the picks of the best marketocracy portfolio managers. I don’t actually recommend picking individual stocks in most cases, but I enjoy it so I do so for a portion of my portfolio. That almost makes me want to tally up my losses, but I don’t think I could bear to face them. For now I’ll just focus on the wins and forget the losses. @super saver. Count me in for the mutual fund :-p.
Ed: Sorry about your link, I am particular about company links being used in my comment section. Thanks! This was a great idea and makes me want to look at my losses too haha. Most of you beat the S&P though, that’s a plus. Very interesting stuff, i am really impressed to see the group of money writers and their mid year performance number as well. I will read more about it.